The new EZiCAT i750xf is Cable Detections most advanced locator to date. Offering management the ability to determine the users GPS position is available on no other locator in the market. The EZiCAT i750xf provides a unique data capture and on board memory function, allowing verification of the locators use and the ability to recall records following a near miss, service strike or similar incident. Management are able to extract information such as time and date of use, user identification and detection mode used. In addition to this for the first time ever, GPS Positioning can now be tracked, providing the ‘Where’ in cable avoidance. Unlike the i750 the i750xf also provides multiple tracing frequencies enabling easier detection of low frequency camera Sondes and the ability to trace services over greater distances. 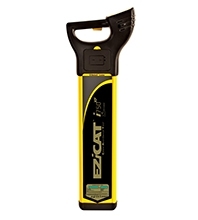 The EZiCAT i750xf features utility depth indication, when used in conjunction with the EZiTEX or Sonde in 8 or 33 kHz modes. Operators can determine the depth of the buried utility, providing an advantage when conducting ground surveys. Multiple Frequencies (including 512 Hz & 640 Hz) Easily locate low frequency camera Sondes and trace services over greater distances.